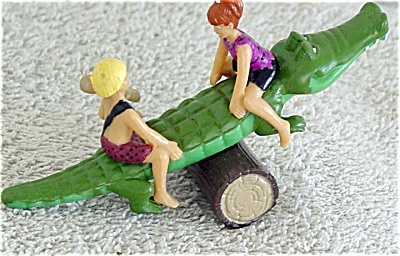 1994 Dakin polyvinyl Flintstones mini-action Figure of Pebbles and Bam-Bam who are riding a see-saw on a crocodile. This mini-action figure was inspired by the Flintstones movie in 1994. It is approximately 2 to 3 inches in size. It is in new and mint condition. Click to expand listing to view of both photographs.